Sgurr na Ciche is a remote mountain at the the head of Glen Dessarry separated from Garbh Choich Mhor by Bealach na h-Eangair. In fact its nearest neighbour, the Corbett Ben Aden, is normally climbed from Barrisdale with the Kyoydart mountains. Sgurr na Ciche is a very craggy mountain and the ascent from Bealach na h-Eangair requires you to follow the faint path left by others or select a safe path through rocky outcrops to the summit. 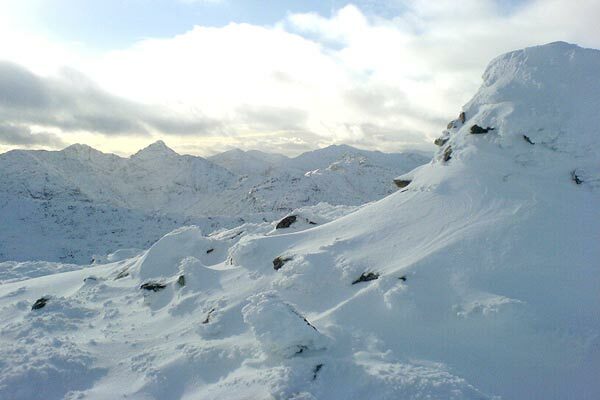 Sgurr na Ciche has a long ridge SW which can be used as a route to Sourlies Bothy if you plan to stay over. Remote Mountain navigate with care. Sgurr na Ciche from Garbh Chioch Mhor, with the Cuillins of Skye in the distance on the left; 12th May 2010. 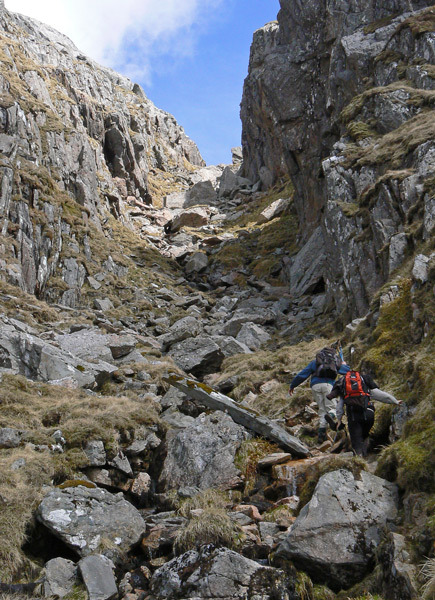 Ascending the gully between Sgurr na Ciche and Garbh Chioch Mhor; 12th May 2010. 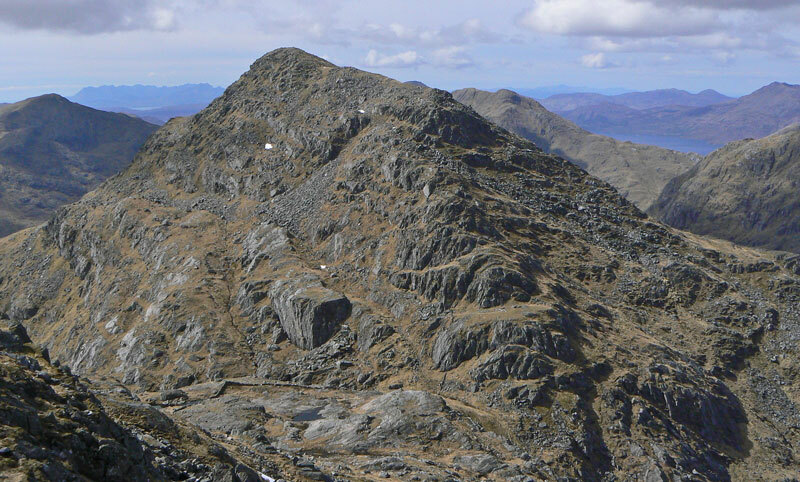 The summary information of one or more ascent routes that include Sgurr na Ciche. 1 1894 m 23.14 km 8 hrs Sgurr na Ciche, Garbh Chioch Mhor and Sgurr nan Coireachan [Glen Dessary] This is a strenuous route on rough terrain, with unbridged streams to cross. 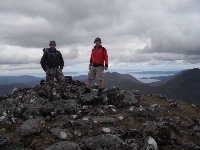 Karl and me on Sgurr na Ciche, 12,6,11. 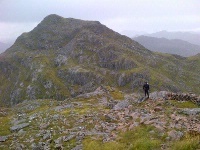 Nick Butterworth on top of Sgurr na Ciche. 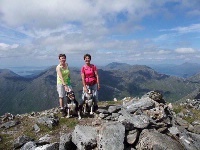 Post a few words about Sgurr na Ciche or read what others have had to say. New signs at car park send walker through the forest blocks to the south of the glen when stalking takes place. I agree the slog back from Sgurr na Ciche is very long but I reckon you have to finish the ridge with that amazing view. Apparently the Allt Coire nan Uth is un-crossable in a spate but the unmarked bridge is downstream adjacent to the forest edge, unseen from the normal crossing point. You can see it from further up the hill, which isn't much comfort if you have wet feet! Amazed how straightforward this ascent was from the col with Garbh Choire Mhor, with a decent little path cutting an intricate route past the crags and emerging very quickly onto the summit ridge. Fantastic viewpoint and happy to catch the hill on a good clear day, perfect end to an east to west traverse.